The City* might have been fogbound and frigid, and parterre.com may continue to offer up the occasional chill (via the Comments’ peanut gallery…aka The Real Housewives of Parterre? ), but there was plenty of warm sunshine and good cheer still to be found in Petaluma. 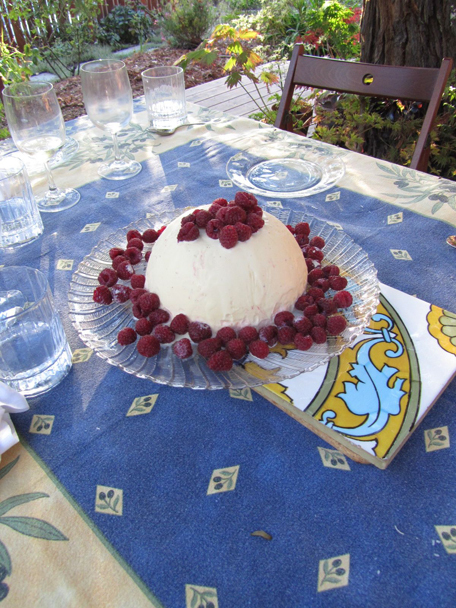 The masterful Cassata alla Melba, a multi-layered ice-cream dream. An attempt to urge a garden-side duet (“Mira, o Norma;” “Sous le dôme épais;” or at least the Barcarolle) from Ching (an operaphile and sometime Parterrian) was unsuccessful. Meanwhile SF Guy shared details of the treasures in his extensive video library (dvds cleverly transferred from dusty Beta videos), including the original mounting of the Hal Prince Butterfly that I’m opening in next Tuesday at SFO! It was televised via Great Performances, with Anna Tomowa-Sintow and Peter Dvorsky. The food would have made Alice Waters salivate, and the English garden turned Ina Garten green with envy. It was fresh, divine, AND oh so very operatic! Kudos to our hosts for their inventiveness, culinary skills and generosity! * referring to San Francisco, NOT NY, however difficult that may be for a New Yorker to swallow.